Simulation is a key component of medical education and a bridge between the classroom and clinical arena. The medical school's undergraduate curriculum includes more than 100 hours of simulation-based learning (SBL), substantially more than what most medical schools are currently delivering. Simulation offers an artificial but sufficiently realistic representation of a person, a situation, event or environment. Simulation provides long-term learning through short-term experiences followed by directed feedback or self-reflection. Knowledge and technical expertise, coupled with refined teamwork and communication skills, are critical for successfully managing patients in a complex clinical environment. 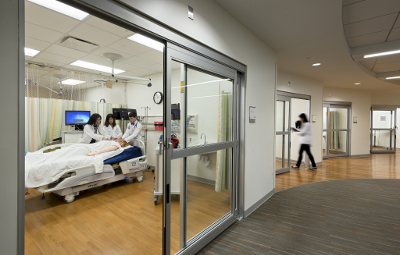 In the Simulation Center, learners develop, master and maintain a variety of skills, including clinical reasoning and decision-making, procedural, communication, teamwork and professional skills. Simulation provides either standardized or customizable learning experiences that are conducted in a controlled and patient-safe environment; it allows for exploration and practice before real-world implementation. It is a bridge between the classroom and clinical application. Faculty utilize all types of simulations and simulators in our undergraduate, graduate and continuing medical education curricula, including role-play, tabletop exercises, partial task trainers, computer-based simulators, low-to-high fidelity mannequins, standardized patients, hybrid simulators and virtual reality devices. Simulation most commonly serves as an instructional tool but it is also used in assessment and in research on human performance under stressful conditions. We have the staff, the technology and the tools to enhance student learning and meet the various goals of our educators. Our Simulation Center at the W.E. Upjohn M.D. Campus is the largest regional academic simulation center in Southwest Michigan and boasts more than 24,000 square feet. The educational space in the Center includes a 13-bed virtual hospital with a large operating room and three debriefing rooms, a 12-room ambulatory clinic, two large control rooms, two procedure labs, two classrooms, an ultrasonography suite and a virtual endoscopic surgery room. Our Simulation Center is an American Heart Association authorized Training Center for Basic and Advanced Life Support (BLS/ACLS), and an authorized Training Site for Pediatric Advance Life Support (PALS). In November 2016, the medical school and Borgess Health unveiled the new WMed Simulation Center at Borgess Medical Center, a 4,100 square-foot facility that features a two-bed clinical room with advanced equipment and high-fidelity mannequins, a procedure room, an FLS Surgery training room and classrooms. 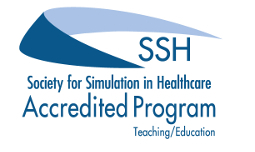 In June 2018, the Simulation Center at WMed was granted full accreditation in the area of teaching/education by the Society for Simulation in Healthcare (SSH), the largest healthcare simulation accrediting body in the world.